Are you ready to become certified as a Vinyasa Yoga Teacher & have the ability to work anywhere in the world to livE a healthier & fulfilling life BY sharing your gifts with others? We invite you to follow the link below to embark on one of the most rewarding steps with senior teacher ERICA BLITZ FROM CALIFORNIA TO DUBAI'S SHORES! Since this course provides a very strong, practical foundation of yoga, it is an important and highly valuable course for yoga students and teachers alike. You will be encouraged and empowered to develop as you immerse yourself in the study of yoga so that upon completion of this course, you will have the tools to teach safely and effectively with insight into the practices of yoga. The main focus of the asana study is grounded in the Krishnamacharya lineage with an emphasis on alignment and the skillful sequencing of vinyasa flow: integrating the movement of the body to the rhythm of the breath in a specific, intentional manner. During this training you will deepen and refine your skills of yoga asana, pranayama, meditation, bandhas, mudras and kriyas. You will learn how to create yoga classes that combine the science of alignment with the creative flow of Vinyasa. This training also includes an introduction to Ayurveda, pranayama, subtle body energetics, restorative asanas, yoga for beginners, prenatal student considerations, and anatomy specific to yoga asana. Knowledge in these areas can be extremely helpful - especially in group classes - which tend to include all types of students. The philosophy component of the program mainly focuses on Patanjali’s Yoga Sutras. You will come away with a good understanding of philosophy through a combination of in-class discussion and self-reflection. Learning about yoga philosophy and ethics will help you gain confidence in your teaching and also provide you with a backdrop for creating class intentions and themes. In addition, you will explore the history of yoga and be able to apply concepts pertaining to the origins of yoga as well as its philosophical underpinnings in your classes - and into your own life. This course, like yoga, is a transformative experience. Like alchemy, we work to create a sealed container for this incredible transformation to take place. As such, the training serves as a sacred space designed for your growth and development. The intention of the curriculum, practices, readings, assignments, course requirements and thoroughness of process reflects a desire to instil excellence and discernment in successful teachers and students. Our mission is to provide each individual with the necessary foundation to skillfully practice and teach with compassion, safety and integrity, while honouring his or her individual voice. We will support your learning, your growth and hold space for you to move you forward in all aspects of your life. Feedback from this program’s graduates is exceptional. It’s very well rounded with its main focus on learning how to be an inspiring and informed teacher. There is no question that it is one of the best investments you could make in yourself physically, mentally and spiritually. The stakes are low and but the potential for positive change (both on and off the mat) is high. You will get what you give. The more you put in, the more you will get out. The aim of this training is to cultivate skill, passion, and intelligence to be able to show up to what life serves you and to teach authentically no matter what challenges you may encounter. You will leave with a stronger asana practice and deeper understanding of how your yoga practice can serve your life and those around you. Expect to deepen and diversify your community through friendships that will long outlast the experience of teacher training. Whether you join us to become a teacher or simply to deepen your own practice and understanding of yoga, this training will change your life. *Enriched with yoga philosophy, daily practices of asana, meditation and pranayama you will be provided with a fun and safe learning environment to grow your own voice and confidence. *This training is a complete and progressive learning experience that will deepen your knowledge and build a solid foundation to become a confident yoga teacher. This training is suitable for anyone new to yoga or with long time experience looking to grow their own practice and refine their teaching. It is recommended that you have had at least 6 months of regular practice prior to the start of the course. Participating in this training will be a profound experience, taking you to places in your body and mind that you never thought possible. You will be required to practice every day during the training. We will be doing lots and lots of yoga - and then a little bit more. While every practice will be suitable for all levels of studentship to participate fully, a daily practice along with practice teaching is a lot of yoga! Leading up to the training, roll out your mat more often - even if for a few Sun Salutations and a Savasana. It will serve you well. Please note: A flexible body free of injuries is not a requirement for this training. In fact, we encourage people with all body types and those with physical challenges to consider this program. Yoga is, at heart, a practice of meeting the body where it’s at, and then working within yourself to slowly and respectfully move deeper. The struggles and challenges you may face through the course of this training will only make you a better teacher. If you are waiting for the day when you can finally get your foot behind your head to become a teacher or commit to take your practice to the next level, you may be denying yourself the opportunity of a lifetime. "After backpacking my way through Europe, I ended up in India by way of a Vogue magazine. Yes, you read that right. I was in Berlin [being half German] flipping through Vogue and came across a story about Goa. At the time, I didn’t even know where Goa was. While I used to live in Germany many moons ago, my German was at the level of Grade 1 - and, unfortunately, it still is. I couldn’t read the editorial, but the images were magnetic. Colourful people, in colourful clothes dancing under the light of the full moon on the beach. The energy of those images leapt from their glossy pages and inspired me to one day travel to India. That day came about one year later. Eventually, I discovered a tiny corner of yogini in me when I realized something unusual happening. My life was transforming: a sense of balance and joy began to infuse every day – even if was a fleeting moment. I wanted more. After five years of practice, my new found passion for feeling into the freedom of both my breath and my body led me to my first yoga teacher training with David Swenson (Ashtanga Yoga) in 2003. With the inspiration of delving deeper into my practice, at the time, I had no intention of teaching yoga, but only understanding my practice, my life, myself. 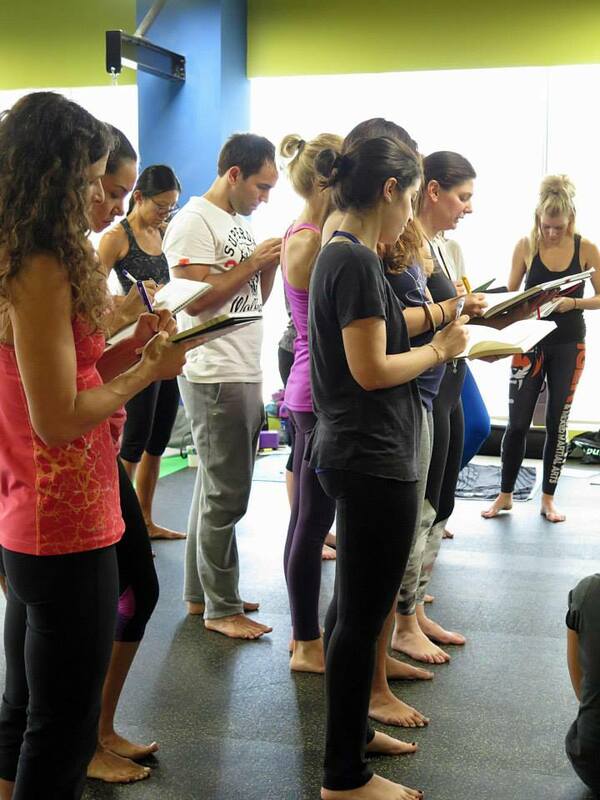 A teacher training is more than just a yoga class; it's a journey into personal transformation and evolution. Not only did I come to a deeper understanding of yoga but I also found my voice and am able to articulate myself with more clarity and grace. I won't deny that it was an emotional experience, but it’s been dramatically empowering, career enhancing, life altering, and it allowed me to access my true potential in every area of my life. My teaching got charged with positive energy, confidence, and compassion; my entire life just lit up and everything just seemed to have fallen into place. I guess that's what they mean by feeling in the flow. And so, with an aura of inner calm and clarity, it seemed like the most natural progression to sign up for my next teacher training, Vinyasa Flow. At some point between completing my first teacher training during university where I was studying developmental psychology, I began teaching. It wasn’t before too long that I decided to leave my graduate work and pursue the path of teaching and writing … I haven’t looked back since. I went back to India. This time for a Yoga Teacher Training at the Krishnamacharya Yoga Mandiram (KYM) with TKV Desikachar in Chennai, India. 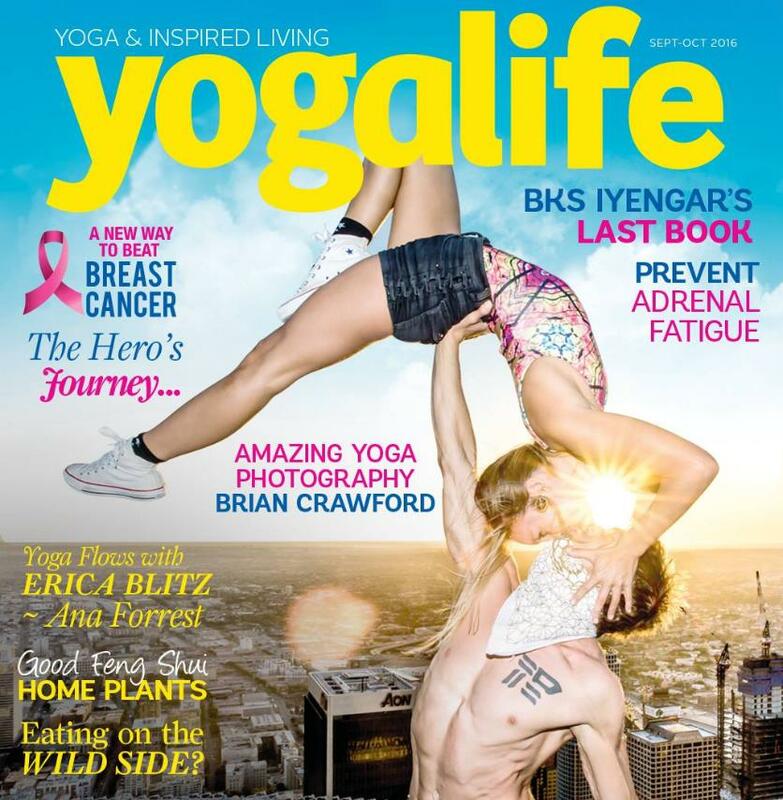 Upon my return from India, I was working as an editor for a magazine and teaching yoga. Eventually, I signed up for yet another training (Yoga Works) and shortly thereafter, I was en route to Shanghai, China to lead my first yoga teacher training. When I was back in Canada, I was approached by YYoga to join their team. I opened up one of their studios, Highgate YYoga, and eventually transitioned to the Director of Learning and Development where I facilitated and organized their events, workshops and trainings. During my time at YYoga, I took my Anusara Teacher Training with none other than Chris Chavez. While life was amazing, I felt like there was something more, something deeper, something else. My husband and I decided to move down to California where we now live. Ironically, Canada called me back to work with Omni Productions. I designed and narrated Season 3 and Season 4 of Namaste TV [all 200hr trainees get a free copy of Season 3 directed by Erica Blitz upon enrollment! ], the world’s premier instructional yoga series. This experience was the perfect marriage of two of my greatest passions: yoga and writing. In between the production, creation, filming and fluttering between Canada and California, I started to put more energy into sharing my love for health and wellness. For me, health isn’t only about a healthy body, but also includes how you nourish your soul and feed your mind. From my believe in a plant-based, nutrient-dense diet of whole foods, I have most recently launched a line of whole food products, nubeleaf.com. Being married to a chef, food is important in our family. I believe in the power to live simple + love big. I believe in counting blessings instead of calories or carbs. I believe that everyone can awaken to their highest potential and live their dream. As my practice on the path continues, I bow with gratitude to all my teachers and traditions —all of whom illuminate the physical, mental and spiritual benefits of practicing and teaching yoga. And while I'm still on the quest for eternal happiness and contentment, I attribute my cheerful, regular-girl aura with a back-to-basics attitude to my longstanding dedication to Yoga - the new wave of minimalism that simplifies life rather than complicates it. 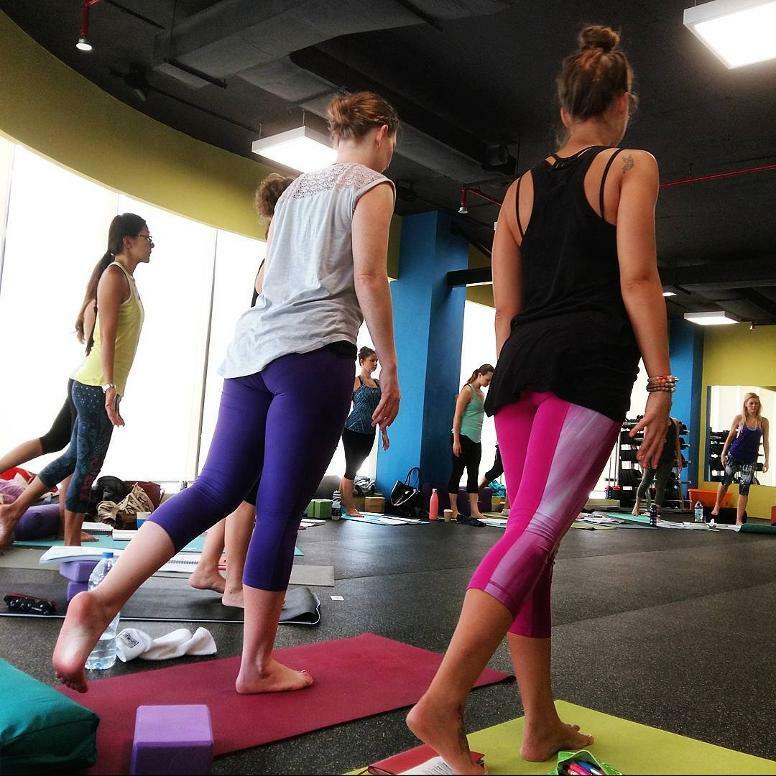 Just a few short months after taking my 200hr Yoga Teacher Training in Dubai with Erica Blitz Yoga through Yogalates Bliss, I am teaching yoga several times a week here in Doha, and after almost a decade and a half of dreaming of being here - it feels beyond amazing to finally be able to do what I love and help others discover their connection with their bodies, breath, and deepest selves on the mat. "With every new path of learning comes the feared “learning curve.” That moment when you realise you may have bitten off more that you can chew. The new information makes no sense and you’re at your wits end with worry. Take a deep breath here for my next statement will amaze you… This was not the case with the exceptional Erica Blitz. On our first day she reassured us, “first layer of paint” she said, “trust in the process.” Erica went on to explain that her course was divided into different layers like painting the walls of your home. Base coat, two or three coats of colour then a top coat to finish the whole process off. I sat there, dubious and a little unsure of “the process” however my mind was soon put to rest. They layers of learning were carefully applied with just the right depth and dexterity of any master painter and decorator. The first week flew by and I was amazed to be feeling full of confidence and more than ready for the next layer. Please secure your place in the training with a non-refundable deposit of 3,500 AED with the remaining balance to be paid in full one month prior to the training. Please note that all teacher training fees once paid will not be refunded under any circumstances. We understand that emergencies and life happens and suggest that you ensure you can fully commit to this program. If for unforeseen circumstances the training is cancelled, full registration fees will be reimbursed but we are not responsible for any other fees incurred by the student such as hotel or airfare. 1. Patanjali's Yoga Sutra - any translation. Please purchase the readings in advance as they might not be available at the bookstores. it takes AROUND 3 weeks to get delivered from bookstores. Amazon and Kindle are great backup options. The intention of curriculum, reading, practices, assignments, course requirements and thoroughness of process reflects a desire to instill excellence and discernment in successful teachers. Feedback on the homework assignments – which are designed to reinforce in-class information and students’ understanding of the information provided will be given. No formal experience is required to enroll in this Yoga Teacher Training program. However, it is recommended that you have had at least 6 months of regular practice prior to the start of the course. Participating in this training will be a profound experience, taking you to places in your body and mind that you never thought possible. We will be doing lots and lots of yoga! Please note: A flexible body free of injuries is not a requirement for this training. In fact, WE ENCOURAGE people with all body types and those with physical challenges to consider this program. Yoga is at heart a practice of meeting the body where it is at, and then working within yourself to slowly and respectfully move deeper. The struggles and challenges you may face through the course of this training will only make you a better teacher. If you are waiting for the day when you can finally get your foot behind your head to become a teacher or commit to take your practice to the next level, you may be denying yourself the opportunity of a lifetime. The time is now and the power is YOU. 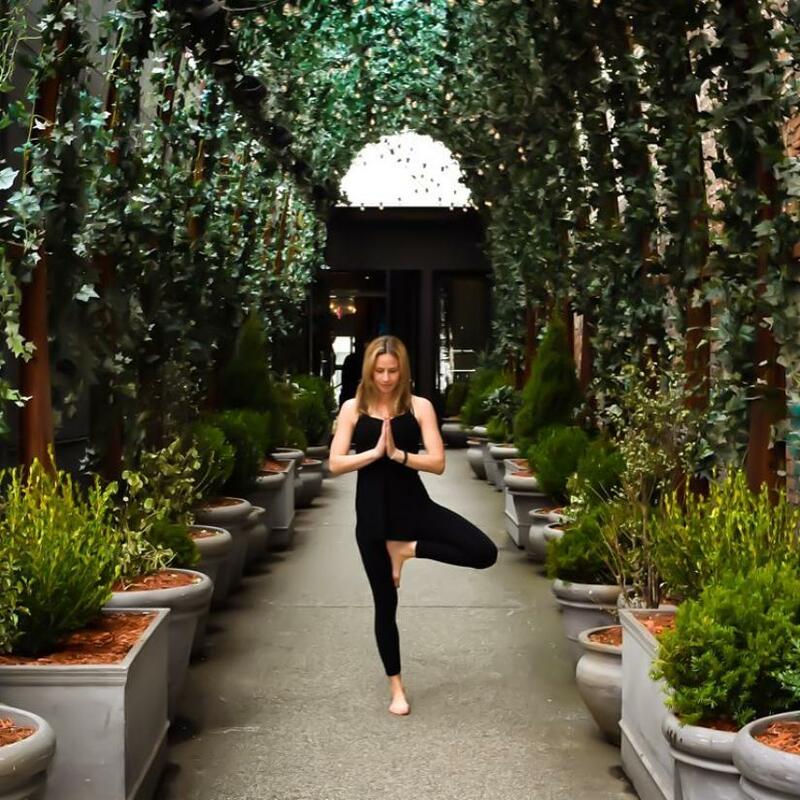 Erica Blitz’s Yoga Teacher Training Program is fully recognized by Yoga Alliance International under Inquire + Inspire [school]. Graduates will be able to register as a Registered Yoga Teacher on the 200hr level (RYT-200) upon successfully completing all the requirements of the program upon the final day of the teacher training. Yoga Alliance is an international governing board for yoga teachers and training program in the U.S and globally.